Rory McIlroy looks anxiously after his tee shot on the 15th. 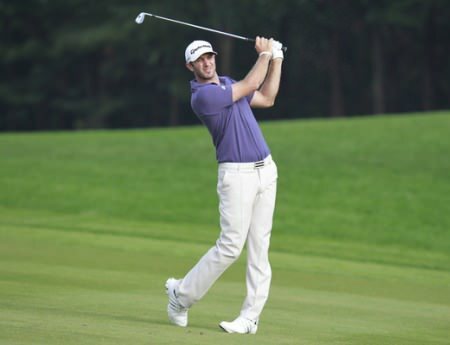 Picture: Eoin Clarke/www.golffile.ie A frustrated and disappointed Rory McIlroy slipped five strokes behind what Graeme McDowell described as an “immense” Dustin Johnson at the halfway stage of the WGC-HSBC Champions in Shanghai. Leading by two after an impressive 65, McIlroy made a hat-trick of birdies from the sixth on his front nine but dropped three shots in a lacklustre back nine to post a 72 that left him where he started the day on seven under par. The world No 6 was lucky to avoid water off the tee at the par-five last but gambled by taking on a 228-yard approach over water and came up short in the hazard. After taking a penalty drop back onto the fairway, McIlroy hit a wonderful fourth shot from 250 yards to 15 feet but missed the par putt and signed for a level-par 72. McIlroy holed a long bomb for birdie at the short sixth, a 10 footer at the short, par-four seventh and then hold from the fringe at the eighth to complete his birdie hat-trick before struggling on the back nine. Bunkered off the tee at the 11th, he caught the face with his attempted escape, pitched to 15 feet but missed the par putt. After scrambling for pars at the 13th and 14th, his approach with a lob wedge found the front bunker at the 15th and he failed to get up and down. “I hit a couple of bad shots and then I guess I let it affect me a little bit and then I started to doubt myself sometimes,” McIlroy said after his closing bogey. “I didn’t hit a lot of quality shots on the back nine. The Holywood native is tied for second place on seven under with Bubba Watson (69) and Boo Weekley (67) but Johnson cruised five clear of the field thanks to an impressive driving and putting display that yielded 10 birdies and just one bogey in a course record equalling 63. McDowell shot a second successive 69 alongside Johnson to end the day in a six-way share of fifth place on six under with Tommy Fleetwood (70), Sergio Garcia (68), Gonzalo Fernandez Castaño (71) and Ernie Els (69). But the Portrush man was blown away by Johnson’s performance and was simply happy to hang tough and mix five birdies with two bogeys. “Yesterday was very solid,” McDowell said. “Today was a little untidier in general, but I hung in there. I haven’t really lit the world up on the greens yet this week, but you know, it was kind of tough to focus when playing with Dustin Johnson, hitting it 350 yards in the middle of the fairways. It was kind of a little demoralising at times. “But I was happy that I hung in there. I hit some good shots today. Played very solidly yesterday. Today was a little off, like I say, but happy to shoot three-under par. Graeme McDowell splashes out of a bunker at the 15th. Picture: Eoin Clarke/www.golffile.ieJohnson, four behind McIlroy following an opening 69, birdied six of his first seven holes - his only par coming on the third - and narrowly missed further birdie chances on the eighth and ninth to be out in 30. The big-hitting American dropped his first shot of the day after missing the green on the 10th, but responded with birdies on the 13th, 14th, 16th and 18th. When it was suggested that Johnson’s round was an example of what was possible around Sheshan International, McDowell said: “What’s possible for an athlete like him who just rips it, that’s not what’s possible for the rest of us sometimes. Johnson was pleased with his effort - he’s 14 under par for his last 33 holes - after being two over after just three holes on Thursday. “Yesterday I doubled my third hole of the day, the 12th, and played really well after that and this morning on the range I worked on a few things and hit it really well coming out of the gates and obviously putted well,” Johnson told Sky Sports. “This course is great, you put this in America and it would hold up to any of them over there. I think it’s a great course, it’s in great shape and the greens are really good but you have to be spot-on with your iron shots because there is a lot of undulation and today I controlled my distance really well and drove it really well. Graeme McDowell continued his love affair with Sheshan International Golf Club when he carded his 10th successive round in the 60s there to lead the WGC HSBC Champions by two shots in Shanghai. Rory McIlroy and Shane Lowry had days to forget in the WGC HSBC Champions in China. As McIlroy shot a level par 72 and slipped 10 strokes behind leader Kevin Kisner, Lowry added a 75 to his 74 to lie 71st on five over. 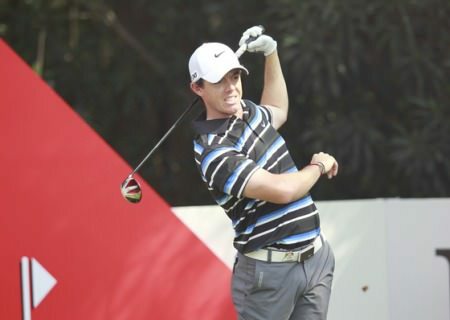 Rory McIlroy know he needs a special weekend if he wants to win his first WGC in China. Pictured in Abu Dhabi earlier this year by Fran Caffrey/www.golffile.ie.Rory McIlroy admits that he has no room manoeuvre now after slipping six shots behind leader Fredrik Jacobson at the halfway stage of the World Golf Championships-HSBC Champions in Shanghai. Graeme McDowell is lurking just four shots behind Dustin Johnson after a third round 64 in Shanghai. 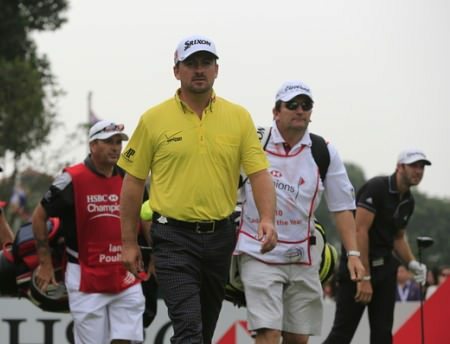 Picture: Eoin Clarke/www.golffile.ieGraeme McDowell is determined to chase down leader Dustin Johnson in the WGC-HSBC Champions so he can close on Henrik Stenson at the top of the Race to Dubai or even overtake him. A determined looking Graeme McDowell marches off the first tee. Picture: Eoin Clarke/www.golffile.ieGraeme McDowell reduced Henrik Stenson’s lead at the top of the Race to Dubai to just €145,865 as he combined with Ian Poulter to make Dustin Johnson fight tooth and claw for victory in the WGC-HSBC Champions in Shanghai.